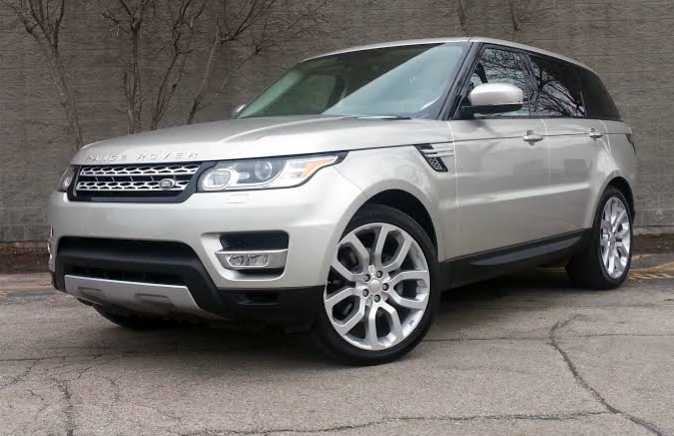 Consumer Guide’s test 2015 Range Rover Sport HSE arrived loaded with options. Including the destination charge, our test truck came to $82,027. 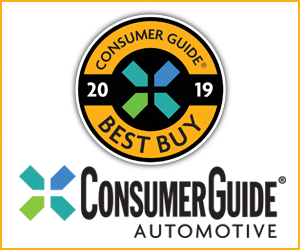 The “middle child” of Land Rover’s Range Rover lineup saw a complete redesign for 2014 and is little changed for 2015, save for the addition of a high-performance SVR model and updated smartphone connectivity. Our test Range Rover Sport was the $68,495 HSE model, which was decked out with a raft of pricey options (including a $1800 metallic paint color and a $3000 set of 22-inch wheels) that bumped the bottom line up to $82,027. 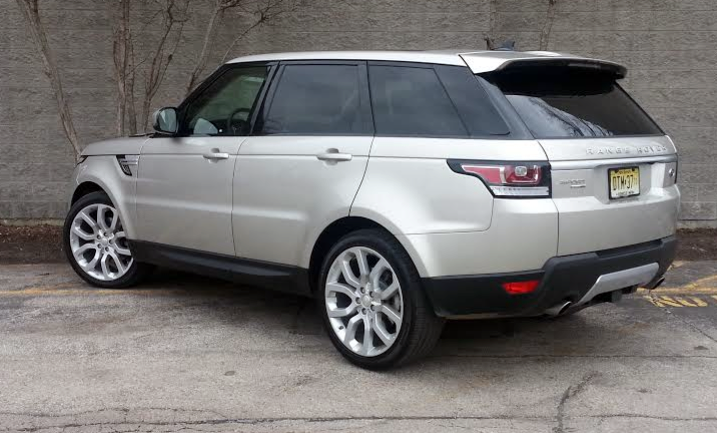 Our test Range Rover Sport’s 22-inch wheels are a $3000 option. Even though it’s past the $80K mark, our test Range Rover Sport is still packing the base engine, but that’s OK. This supercharged 3.0-liter V6 is a sweetheart of a powerplant. 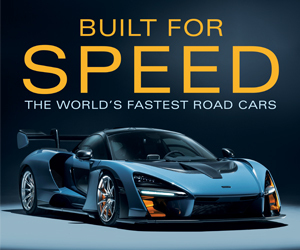 It puts out a healthy 340 horsepower via a smooth-shifting 8-speed automatic transmission. You can also get a Range Rover Sport with a supercharged V8 that puts out 510 horsepower (or 550 in the SVR), but we never found ourselves wanting for power with the V6. There’s decent thrust on tap from most any speed. 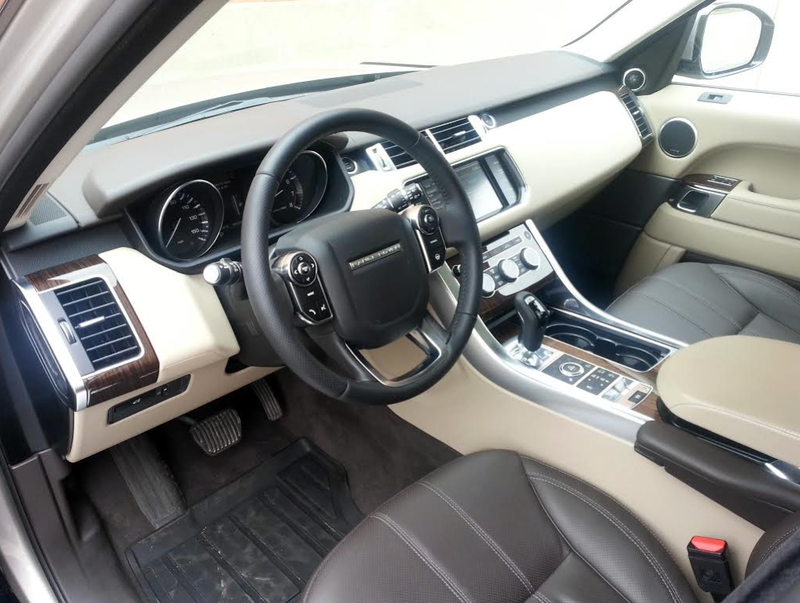 Range Rover Sport boasts top-notch cabin materials and impressive workmanship. Thanks in part to its aluminum body, the Range Rover Sport is fairly lightweight for its class, but it’s still a hefty vehicle by absolute standards. Its fuel-economy numbers—17 city/22 highway/19 combined–are respectable for a midsize luxury SUV with the kind of get-up-and-go it offers, but that’s still a rather prodigious appetite for premium fuel. I averaged a touch above 20 mpg in my 230-mile test, which was about 70 percent highway driving. I did a fair amount of cargo hauling during my test, and the Range Rover Sport doesn’t really shine in this arena. There’s less cargo room inside than you might expect. The rear cargo area has a fairly high floor, and it’s narrower than many class competitors. The folding second-row seats don’t fold that flat—they angle upward, which can make loading long or especially large items a bit tricky. The Range Rover Sport fares slightly better in passenger accommodations. Four adults can fit in comfort, though a middle passenger in the rear seat will be sitting on a poorly padded, uncomfortably shaped seat, and will likely be cramped as well. Entry and exit is easy both front and rear, thanks to the ‘just-right” ride height and generous door openings. The cabin boasts true luxury-level materials most everywhere you look, and a pleasant, understated layout that feels like it will age well. We’re less enamored with the touchscreen infotainment system. It’s not particularly quick to respond to inputs, and it absorbs many simple functions, making them a bit more complicated than they need to be. 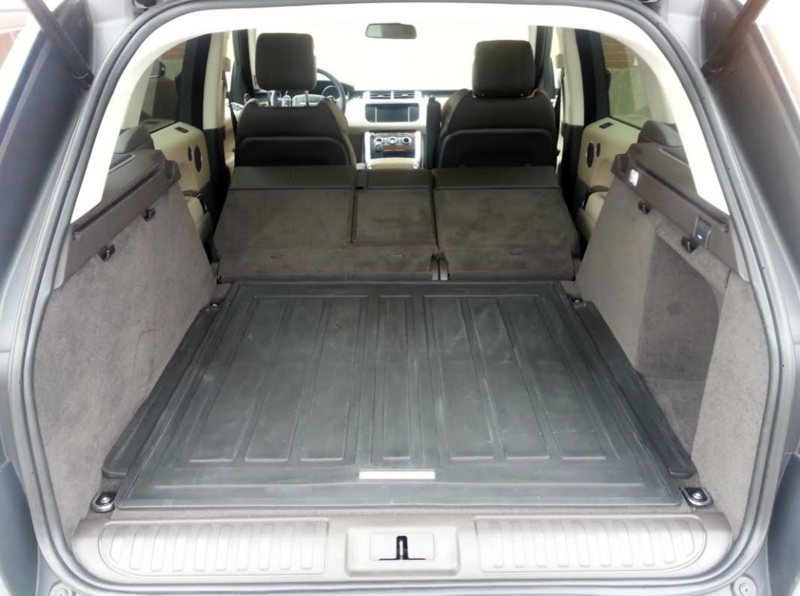 The Range Rover Sport’s cargo area is a little smaller and narrower than consumers might expect. Additionally, the second-row seats don’t fold particularly flat, which can make it tricky to load long or especially large items..
We didn’t have the chance to sample the Range Rover Sport’s formidable off-roading capabilities during our test, but our HSE delivered a smooth ride and reasonably athletic moves on the highway. That smooth ride was especially noteworthy, considering our tester was equipped with the step-up 22-inch wheels in place of the standard 19s. The steering is nicely boosted—it’s quick at low speeds for easy close-quarters maneuvering, yet it firms up nicely at highway speeds. Any Range Rover is a supremely expensive vehicle that puts prestige and attitude before value. Still a Range Rover Sport has a lot to offer the well-heeled shopper: handsome styling, unmistakable brand identity, strong acceleration, and an unmatched blend of on- and off-road performance. Written by: The Daily Drive staff on April 22, 2015.on March 26, 2019.